This week has seen some of the best athletes in the snowsports community touch down in Milan ready to compete in the first big event of the season, the Big Air World Cup! One such athlete is 25 year old, UK snowboarder Aimee Fuller. Despite being born in Kent, England (where getting even an inch of snow is a rarity), Aimee had her heart set on becoming a professional snowboarder from a young age. Spending every weekend at her local dry ski slope, before moving to Virginia, USA when she was 12, sparked a passion that would later turn into a hugely successful career, enabling Aimee to travel the world and follow the snow. Whilst living in the USA, Aimee had access to real snow and snow parks where she could practice her snowboarding and develop her skills as a future slopestyle rider. After 3 years in America and shortly before moving back to the UK, Aimee attended a snowboard camp, resulting in sponsorship from Roxy! Fast forward to the present day, Aimee is well known and well loved in the snowsports community. She holds a number of impressive achievements to her name; including competing in the highly anticipated Slopestyle event at the 2014 Winter Olympics alongside the best snowboarders in the world. Aimee is one of my favourite snowboarders, not only because she’s awesome at her sport and inspires me to push myself on the snow, but because she always looks like she’s having the best time! I love that despite being one of the best athletes in the world and competing in the biggest events, Aimee hasn’t lost sight of what snowboarding really is all about; having fun. I was lucky enough to talk to Aimee recently about the upcoming season, event preparation and the ultimate question; park or back country?! Hey Aimee! Where are you in the world at the moment and what are you doing? I am currently say on a Ryan Air flight to Biarritz, excited to head to France to link up with the Roxy gang for Team week. The Winter season is nearly upon us yessss! What are your goals/plans for the upcoming season? Olympic qualification begins, so that’s my main focus. My first Big air event is in Milan in November! When you were young, what inspired you to follow your dreams and do something different? 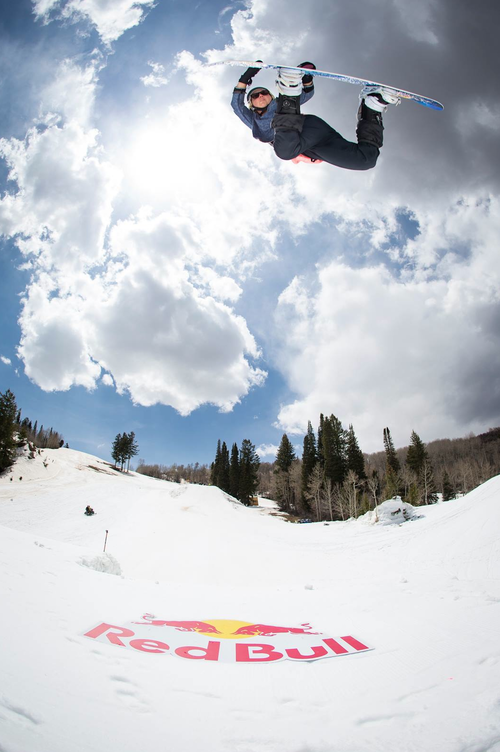 I always liked to go fast, and get upside down, gymnastics and motocross have played a big role in my inspiration to push myself on my snowboard. I can thank my Dad for sticking me on 2 wheels at such a young age. Where is your favourite place to snowboard? I love Absolut Park in Austria and also the Tirol valley is pretty mint too! Who inspires you both personally and professionally? Personally my friends and family, professionally, it has to be Laura Trott. She has shown that hard work pays off, and I have a massive amount of respect for the physical punishment she as a cycle athlete has to put herself through to compete at such a high level. You compete in slopestyle which means ALOT of intense training, how do you prepare your body through both exercise and diet? I love keeping fit and enjoy it as a compliment to my snowboarding. Slopestyle requires, explosive strength , endurance , agility and power, it’s a combo of everything so you have to challenge your body in as many ways as you can to be fit for the mountain. I have also begun yoga 2 x a week at Core gyms to compliment flexibility and mobility on my board. Diet is huge in our sport, you need to be fuelled to perform but you also want to stay light so you can be explosive off the take-offs. I eat a high protein diet, lots of lean meat, fish, Nutrii Quark, it’s like a high protein yoghurt, oats, fresh veggies! I’m also a sucker for pancakes and waffles, so I refuel with carbs after training. What do you enjoy doing on your ‘down time’ when you’re not on the snow or training? Hanging with my Man, exploring the city on my bike, cycling and eating good food. What’s been your greatest achievement so far? 2x WST Pleasure Jam Winner, First women to land a double in competition at X Games. You represented GB in the Sochi Olympics and made it to the semi’s, will we see you in South Korea in 2018?! YES so excited to begin the Korea Qualis! As a new event at the 2014 Winter Olympics, slopestyle created a real buzz and as a result a lot more people seem to be taking up snowboarding. How important is it to you to inspire the youth and in particular females to get into the sport? I love the passion and interest that came about after Sochi, I hope we can go to Korea and re create that buzz and hype about the sport. It’s so much fun, I just want to share my passion, it’s a sport anyone can do, no matter age, size, it’s all about getting out there and having fun. Places like The Snow Centre at Hemel are fantastic to start with a huge indoor slope just outside London. Also check out GO Ski ~Go Board, you can find your closest slope and how to get involved there! I had an ACL op last year and I’m still finding it hard to overcome the fear of injuring myself again on the snow. How do you mentally recover from an injury to ensure you come back as strong as before? Start small and work your way up, it’s the small steps that make the big ones possible. Mental strength is one of the hardest parts of our sport, my secret is to try something new on snow everyday, not matter how small it is, that stoke and passion will keep you coming back time and time again. And finally, epic park run or fresh back country powder?! Can I not have both, one after the other ;)! Thanks Aimee, wishing you all the luck this weekend and for the Olympic quali’s! Thanks Aimee! Here’s to adventure and mountain happiness!